Of all the many colourful tales to be found in beer's millennia-long history, there are few that people enjoy telling more than that of the original saisons, mainly because the beer was originally brewed by farmers to water their workers at harvest time when they were given a daily allowance of up to five litres... With most contemporary saisons tipping the scales at or above the 6 percent mark, you can imagine the chaos that may have ensued. But back in the days when the beers that became saison were first brewed, they were typically much lower in alcohol – usually around 3 percent. Having released plenty of saisons above the 6 percent mark, this is the first of La Sirène's beers to be styled more like those originals. 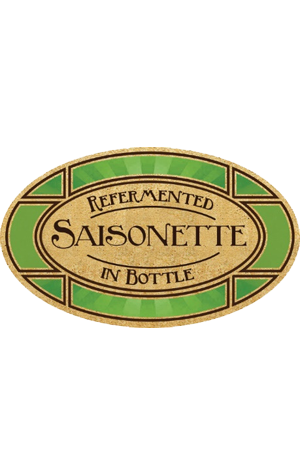 Saisonette registers just 3.8 percent ABV, leading off with prominent lemon aromas to the fore before hints of the spices and funk inherent in the brewery's other saisons come through. The most noticeable difference between this and the other saisons in the range is in the body: this is noticeably lighter, washing over the palate in the most cleansing of manners.